In recent years, there has been concern about the social impact of the Internet on several levels. One major worry was that use of the Internet would prompt people to withdraw from social engagement and become isolated, depressed, and alienated. A related fear was that Internet users might abandon contact with their local communities as they discovered how easy it is to go online to communicate with those in other parts of the world and get information from every point on the planet. We surveyed 1,697 Internet users in January and February to explore the breadth and depth of community online. Our findings suggest that the online world is a vibrant social universe where many Internet users enjoy serious and satisfying contact with online communities. These online groups are made up of those who share passions, beliefs, hobbies, or lifestyles. Tens of millions of Americans have joined communities after discovering them online. And many are using the Internet to join and participate in longstanding, traditional groups such as professional and trade associations. All in all, 84% of Internet users have at one time or another contacted an online group. The pull of online communities in the aftermath of the September 11 attacks shows how Americans have integrated online communities into their lives. In the days following the attacks, 33% of American Internet users read or posted material in chat rooms, bulletin boards, or other online forums. Although many early posts reflected outrage at the events, online discussions soon migrated to grieving, discussion and debate on how to respond, and information queries about the suspects and those who sponsored them. With the dramatic displays of community spirit around the country following September 11, there are hopes that Americans’ repulsion and shock the attacks might have sparked a renewal of civic spirit in the United States. The existing vibrancy of online communities profiled in this report suggests that Internet groups can play a supporting role in any enduring boon to community life in the aftermath of the attacks. Our winter survey also showed that many Americans are using the Internet to intensify their connection to their local community. They employ email to plan church meetings, arrange neighborhood gatherings, and petition local politicians. They use the Web to find out about local merchants, get community news, and check out area fraternal organizations. Moreover, there is evidence that this kind of community engagement is particularly appealing to young adults. Sociologist Barry Wellman argues that many new social arrangements are being formed through “glocalization” – the capacity of the Internet to expand users’ social worlds to faraway people and simultaneously to bind them more deeply to the place where they live. This report illustrates how widely “glocalization” is occurring. The Internet helps many people find others who share their interests no matter how distant they are, and it also helps them increase their contact with groups and people they already know and it helps them feel more connected to them. 79% of Cyber Groupies identify at least one particular group with which they stay in regular contact. 49% of Cyber Groupies say the Internet has helped them connect with groups or people who share their interests. Cyber Groupies try out different groups; the average Cyber Groupie has contacted four online groups at one time or another. Use of the Internet often prompts Americans to join groups. More than half of Cyber Groupies (56%) say they joined an online group after they began communicating with it over the Internet. This includes those who joined traditional groups whose existence predated the Internet, such as professional or fraternal groups. In other words, Internet access is helping people join all kinds of communities, including those that are not exclusively virtual communities. 40% of Cyber Groupies say the Internet has helped them become more involved with groups to which they already belong. In addition to helping users participate in communities of interest that often have no geographical boundaries the Internet is a tool for those who are involved with local groups, particularly church groups. 26% of Internet users have employed the Internet to contact or get information about local groups. That comes to 28 million people. In the face of widespread worries that community activity is ebbing in the United States, these findings demonstrate that the Internet, while not necessarily turning the tide, has become an important new tool to connect people with shared interests globally and locally. In some ways, online communities have become virtual third places for people because they are different places from home and work. These places allow people either to hang out with others or more actively engage with professional associations, hobby groups, religious organizations, or sports leagues. These groups are lively online communities. People exchange emails, hash out issues, find out about group activities, and meet face-to-face as a result of online communities. Approximately 23 million Americans are very active in online communities, meaning that they email their principle online group several times a week. 60% of Cyber Groupies say they use email to communicate with the group; of these emailers 43% email the group several times a week. 33% of the 28 million Local Groupies who use email send email to their main local organization several times a week. Many Cyber Groupies and Local Groupies say that online communities have spurred connections to strangers and to people of different racial, ethnic, and economic backgrounds. 50% of Cyber Groupies say that participation in an online community has helped them get to know people they otherwise would not have met. 35% of Local Groupies say that participation in an online community has helped them get to know people they otherwise would not have met. This lower number relative to Cyber Groupies may be due to the fact that Local Groupies probably were acquainted already with members of the online group. 37% of Cyber Groupies say the Internet has helped them connect with people of different ages or generations. 27% of Cyber Groupies say the Internet has helped them connect with people from different racial, ethnic, or economic backgrounds. The types of connections people establish depend on the kind of group to which they belong. Members of some cyber groups go to their groups to establish personal relationships, while others just want to keep up with group news and activities. Members of belief groups, ethnic online groups, and especially online groups oriented to lifestyle issues are most interested in using the Internet to establish personal relationships. 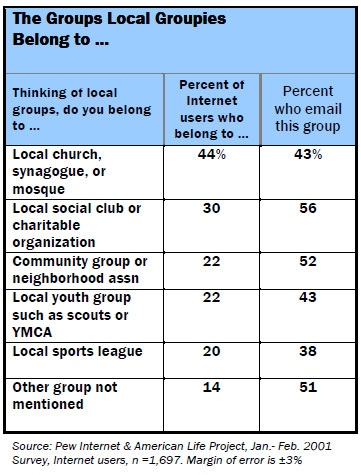 Members of entertainment, professional, and sports online groups tend to use email in group activities less often than those who belong to other kinds. They focus their online activities on getting information about popular culture. Men tend to be drawn to online groups involving professional activities, politics, and sports. Women tend to be drawn to online medical support groups, local community associations that are online, and cyber groups relating to entertainment. There are differences between those who have used the Internet to join a group and those who use the Internet to participate in groups to which they already belong. Many who join online groups are relative newcomers to the Internet. They tend to be urban dwellers, young adults, and less well-educated than the typical Internet user. As a cohort they are more ethnically diverse than other Internet users, and more likely to be interested in online groups relating to fun activities. The 56% of Cyber Groupies who joined a group after having first contacted it through the Internet have very different tastes in online groups than the “Long-timers” who belonged to the group before engaging with it online. Joiners of Cyber Groups identify hobby groups as the online community that they contact most, followed closely by trade or professional associations. A significant number of joiners also say they contact online fan group of an entertainer or TV show. In contrast, Long-timers are most likely to say they are most closely in touch with trade or professional groups online. At the local level, Long-timers are anchored in faith-based and community groups, while the joiners—who make up 20% of the Local Groupie population—show a greater tendency toward groups devoted to sports or with an explicitly social orientation. Net Joiners of local groups are demographically diverse. They also tend to be highly experienced Internet users. This suggests that the Internet use is drawing new and different kinds of people to local groups. Once people have found local groups online and joined them, they report high levels of community involvement. These differences among Joiners—particularly their relative youth, newness to the Internet, and racial diversity—suggests that the Internet may be drawing a segment of the population to community engagement who have not been very tied to civic activities. Political scientist Robert Putnam has argued that one major reason for the decline in civic engagement in the United States is the reluctance among younger people to participate in community groups.1 Our findings indicate that many young people are turning to the Internet as an outlet for community activity. Although young people tend to focus on online groups that involve hobbies, they also are much more likely than other users to report that the Internet has helped them become more involved organizations in their community and connect with people of different generations, economic backgrounds, and ethnic groups. In other words, the primary draw to online communities for young people appears to be hobby groups; however, a secondary outcome, as young people surf to other online communities, is to connect many to groups that help foster civic engagement. At the local level, people use the Internet mainly as an information utility to find out about local merchants and community activities. The Internet’s role in public deliberation is modest. Public access to the Internet is only moderately available throughout the United States. 41% Internet users say that they “often” or “sometimes” go online to seek out information about local stores or merchants. 35% of Internet users “often” or “sometimes” go online for news about their local community or to find out about community events. 30% go online “often” or “sometimes” for information about local government. 24% go online “often” or “sometimes” to get information about local schools. 13% of Internet users say that they “often” or “sometimes” email public officials. This low rate may be because only half of all Internet users say their town has a Web site, and few Internet users find the town’s Web site very useful. 11% of Internet users say that they are aware of at least one local issue in which the Internet played a role in organizing citizens to communicate with public officials. However, this percentage doubles to 22% for Internet users who are active members of online communities. 51% percent of all Americans know of a place in their community where the Internet is publicly available. Overwhelmingly, these places are public libraries. African-Americans are the most likely to say that their community lacks public access to the Internet; 42% of African-Americans say their community does not have publicly available Internet terminals somewhere, compared with 29% of whites and 33% of Hispanics.